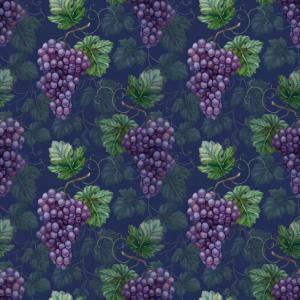 A wine and grape theme brings to mind a Tuscan or French Country vineyard, and this motif is commonly seen in both of these Mediterranean-inspired decorating styles. This theme can help you create an elegant kitchen design that perfectly suits a refined, wine-drinking lifestyle. Light-colored walls, such as pale yellow, apricot, wheat or cream walls, make a nice background for the various shades of dark purple, plum, burgundy and green in grapevine and wine motifs. These lighter shades also contrast well with dark wood and black wrought iron. Consider applying a color wash on the kitchen walls using a glaze color a few shades darker than your wall color. 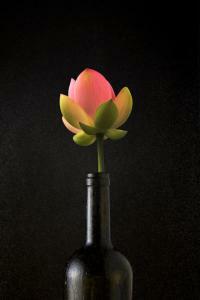 This creates a faux texture resembling aged plaster, which makes a perfect complement to a wine and grape theme. Elegant grapevine stencils make lovely embellishments along kitchen ceiling borders. You can also use a grapevine stencil over an arched entryway or kitchen window. Some grape stencils also include wine bottles. Use a wine and grape stencil to customize cabinet doors a hutch. If you don't have the patience to create a hand-painted design, look for a wine and grape theme wallpaper border or peel and stick wall decals. You'll find grapevine stencils at All About Stencils and vinyl wall decals at Re-purposed Press. Wine and grape wallpaper borders can be found at Borders to Go. Insert a taper style drip candle into the mouth of an empty wine bottle. You may need to shave some of the wax off the bottom of the candle to make it fit. Light the candle and allow the wax to run down the sides of the bottle. Use a color changing candle for the most interesting effect. Make sure you place something underneath the bottle to catch the wax. If you know how to work with glass, you could cut off the bottom of a wine bottle and make it into a hurricane lantern. Alternatively, you could drill a small hole at the bottom of a bottle and insert string lights to make a unique accent lamp. You can find many do-it-yourself tutorials for re-purposing wine bottles online, including how to make wine bottle pendant lights. Hand-painted ceramic tiles with a wine and grape or vineyard theme can be used to create an artistic, Tuscan-inspired backsplash. Use the tiles to create a mural-like scene centered behind the stove, or use wine and grape accent tiles scattered throughout a tile backsplash to give your kitchen a Mediterranean feel. 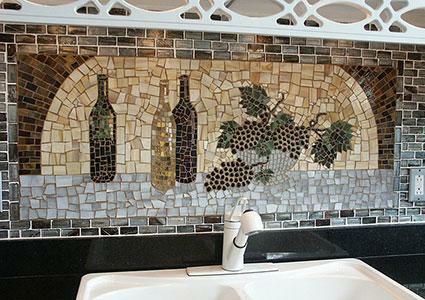 You can find wine and grape theme ceramic tiles at Linda Paul Studios and Pacifica Tile Art Studio. If you like boxed wine, drink it in style by transferring the bag into a miniature wine barrel made from real oak. These stylish dispensers hold up to 10 liters of wine and rest on a wooden stand so you can fill your glass straight from the spigot on the front. You can also personalize your barrel with laser engraving on the front. Wrought iron wine racks make perfect accessories in a wine and grape themed kitchen. You can find them in countertop versions, floor versions, and hanging wall racks, often with grapevine embellishments. Large wooden wine barrel racks make nice counterparts to the wine barrel dispensers. 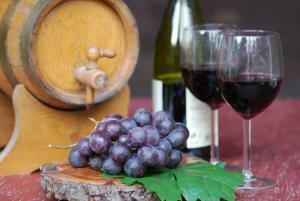 You'll find a large selection of wine racks and wine barrel dispensers at Sterling Wine Online. There are also some hanging wine racks at Bed, Bath and Beyond that are perfect for keeping a small collection handy in the kitchen, including a few wrought iron grapevine racks. 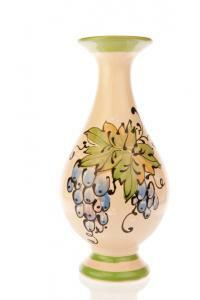 Hand-painted or etched wine glasses and carafes featuring grapes make beautiful display items in your kitchen. This glassware is too pretty to hide away behind closed cabinet doors, so find just the right spot on a hutch, buffet or countertop. You might even consider installing a shelf just for them. Hand-painted wine glasses also look great displayed on wrought iron hanging wine racks. You'll find etched wine glasses at CrystAlaCarte and Gifted Grape. Etsy has a nice selection of hand-painted grape themed glassware. Collecting wine and grape theme accessories for your kitchen can be addicting since there are so many beautiful items to choose from. You'll find a large collection of wine and grape theme accessories at Touch of Class and J Mark Cutlery. Stained glass items such as pendant and ceiling fixture shades, sun catchers, and wall and window hangings, make beautiful décor. 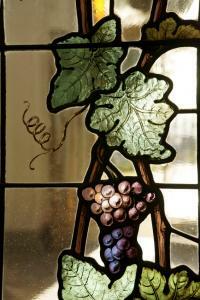 You can create the illusion of stained glass in the kitchen window by applying grapevine window film. Stained glass items can be found at Houzz, and grapevine window film is available at Wallpaper for Windows. Choose the wine and grape accessories that appeal to you the most. As your collection grows, you can rotate some of your decorative items. Keep your wine and grape theme looking classy by not over cluttering your kitchen with too much décor.